TEGUCIGALPA, Oct 5 2017 (IPS) - On the north side of the Honduran capital, nine poor neighbourhoods are rewriting their future, amidst the violence and insecurity that plague them as “hot spots” ruled by “maras” or gangs. IPS toured one of the shantytowns – known in Honduras as “colonias” – to get an up-close view of a project of urban development and social inclusion promoted by the government as part of an effort to recuperate public spaces and generate opportunities for change for local families, and especially the young. The Integral Programme for Urban Coexistence (PICU) has been implemented by the government’s Water, Sanitation and Community Development Institute (IDECOAS) with 12.8 billion dollars in funds from the Inter-American Development Bank (IDB), for the 2013-2017 pilot phase. “Aren’t you wearing an orange t-shirt? Find her one from the project, to avoid problems!” a member of the PICU staff says, referring to this IPS correspondent, just before the start of a tour of one of the “colonias” involved in the programme. He explains that in order to avoid trouble with “the guys” (gang members), people who work on or visit the project have to wear an orange t-shirt or vest from the programme. That is one of the conditions for working or moving about without problems in the neighbourhoods ruled by the maras, blamed by the local authorities for much of the violence in this Central American nation of 8.5 million people, which has a murder rate of 59 per 100,000 population, compared to a global average of 8.8 per 100,000. In Honduras there are an estimated 25,000 members of gangs, the largest of which are the Mara Salvatrucha MS-13 and Pandilla 18. Carrying out the PICU in these areas was not an easy task. The first step was a careful effort to identify key actors in the community willing to support the initiative, which has included the construction of infrastructure, values transmission through sports, and support for micro-enterprise and small businesses to boost family incomes. Neighbourhood activists acted as intermediaries with the gangs to work out “codes” that would govern the relationship, before the PICU was launched. The project’s staff members talk openly about the process of negotiation and coexistence, explaining that some of “the guys” even work as labourers on infrastructure projects such as street paving or the installation of water pipes. It is part of the control exercised by the gangs in the area. By “here” she means the Ramón Amaya Amador colonia, named after a Honduran writer, playwright and journalist who died in exile in 1966. Founded over 40 years ago, when the original inhabitants occupied the land and started building homes, the colonia is also known as “Pantanal” or “swamp” because of its muddy streets, which until recently reminded people of a popular Brazilian soap opera of that name, which aired in 1990. Surrounding this colonia are others, such as Arcieri, Montes de Bendición and David Betancourt, also participating in the pilot phase of the PICU, which IDECOAS is starting to extend to five other poor neighbourhoods, all of which were built on the steepest hillsides of Tegucigalpa, a city surrounded by a chain of mountains. 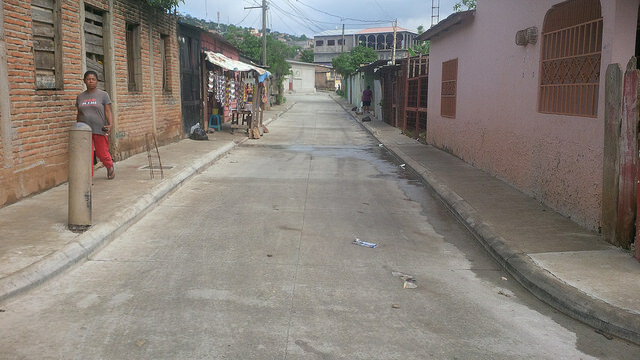 The colonias involved in the project are home to a combined total of over 7,000 people, and are now connected by paved streets instead of narrow paths and dirt roads. 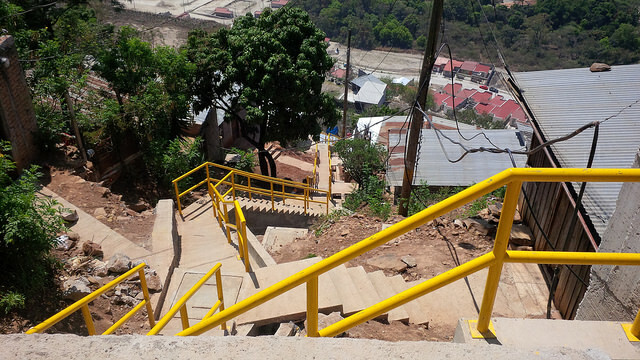 They also now have proper stairways connecting them to the rest of the city, sanitation and sewage systems, piped water, electricity, and sports complexes, among other services that until only recently were unthinkable. “For them these changes are a dream; 40 years ago no one even dreamed of what they’re seeing now,” said Leiva. “All of the projects were agreed with them. The community cooperated with everything, and they take it upon themselves to guarantee the safety and the lives of all of the engineers, construction workers, teachers and other workers carrying out the projects in the community,” she said with pride – a term frequently used by all of those involved to describe what they feel. “This pilot programme is important for us,” the IDECOAS minister, Mario Pineda, told IPS. “We are looking for social interaction that also makes it possible to rebuild the social fabric in this area, so the ‘bad guys’ who live in these colonias see and understand that there are other ways to live together in a better fashion. “In the corridor that includes Amaya Amador, an average of 1,300 young people have joined different sports disciplines and other activities, and some have even taken part with success in international competitions,” he said. Proud of the work carried out with Cuban technicians assisted by Hondurans, he shows IPS the different disciplines he has been working on for the past year with children between the ages of 7-11 and adolescents between the ages of 12-18. In community centres and spaces offered by the Catholic Church, young people can be seen training in disciplines like weight lifting, taekwondo, table tennis, handball or track and field. Some of them are former gang members. “We are breaking down barriers,” says Rivero. “I am from a country where human beings come first, and that is the methodology we’re using. 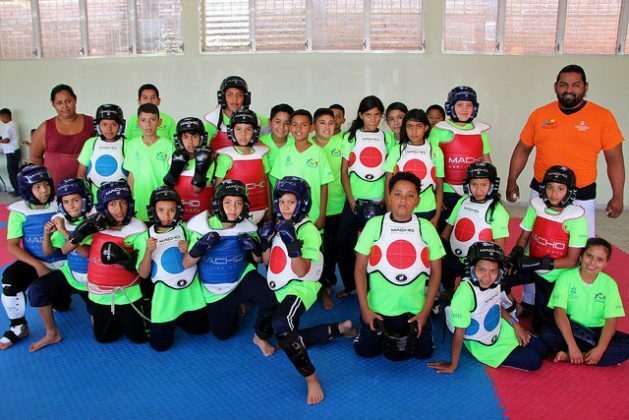 We have rescued kids with serious problems, and today we can say that many of them have won bronze and silver medals in national or Central American competitions. “Who could have imagined this? Honduras is a country with talented people and we are only helping to discover it and demonstrate it,” he added. Jeffrey Sierra, a 13-year-old who lives in the David Betancourt colonia, is one illustration: he could never have dreamed of being on the Honduran table tennis team. “Football is king here, but it’s not for me, I have asthma. But I can play table tennis. Just think, I’m part of the national table tennis team, wow!” he tells IPS with a broad smile. Four other youngsters from his colonia are also members of the national team, which fills them with awe as well as pride. And it’s understandable. 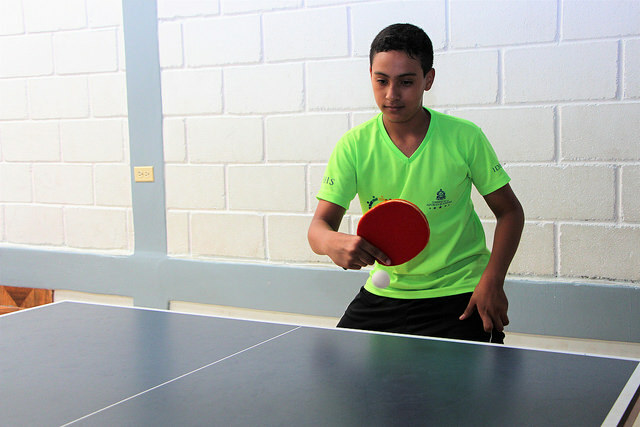 In the table tennis competition, they won a bronze medal at the regional Central American level, while other youngsters from this area took second place in track and field and weight-lifting, and they have travelled in Honduras as well as Cuba and Guatemala. Their faces show the joy they experience. They train for two or three hours a day and some do community labour afterwards. The gang members respect them, and they all dream of going to the public university and becoming coaches one day. The community has organised in committees to plan how to keep the project going in the future, and to push for further works in the colonias to continue the urbanisation process.